Hermit Crabs can be broken down into two groups: Marine and Land. 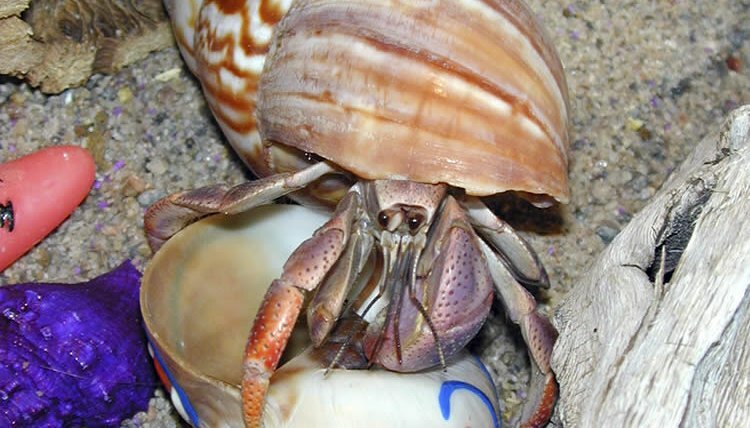 The Marine Hermit crab rarely leaves water for land and the Land Hermit Crab rarely leaves land for water, although they do need access to freshwater and saltwater. Marine hermit crabs are mostly kept in "Reef Fish Tanks" and they are easier to care for than the land variety because their gills require no advanced care. Many species of hermit crabs exist and they can live up to twenty years with proper care! Here we'll concentrate upon the land variety of hermit crab. Remember the old adage, "A crab's home is its castle?" Probably not, but this misrepresentation of an old adage does ring true for the health and well being of your pet hermit crabs! Yes, hermit crabs can feel stress. It will take time to set up a new home suitable for your pet. Ideally, an enclosure should be prepared and stabilized before bringing your hermit crabs home and thus preventing them from stressing. Stress occurs with temperature, humidity, and location changes. The results can be loss of limbs, lethargy, and even the death of your hermit crabs! So stop your crabbing and forget housing your hermit crabs in small plastic cages and containers! Glass aquariums make good, spacious housing for hermit crabs who love climbing and exploring. Two hermit crabs in a ten gallon aquarium is fine but any more than two and you should upsize to at least a thirty gallon (or more) aquarium. Make certain the aquarium is secure because hermit crabs are very good escape artists. A wire mesh latched lid is perfect if you have a warm, humid house. But dry air in your home can alter the enclosure's humidity level and it would be best to use a plexiglass or glass lid, or even a mesh lid half covered with plastic wrap. Hermit crabs have modified gills that allow them to breathe air. Without that tropical island feel (no lower than 70% humidity) their gills begin to dry out and they will slowly suffocate! And never leave a glass aquarium in direct sunlight or you'll run the risk of baking your hermit crabs! A substrate is a material such as sand or coconut fibre that is placed on the bottom of the enclosure for the hermit crabs to dig, burrow and tunnel. Substrates are kept damp (but not soaked) and aid in stabilizing humidity levels. Sand and coconut fiber are two preferred substrates that can be combined if you wish. Crushed coral is also an option. Avoid wood chips, gravel, or anything preventing the crabs from digging. An hygrometer is a must for your enclosure for measuring humidity accurately. Relative humidity is kept between 75% and 90% while actual humidity should be between 50% and 60%. Thermometers are great temperature monitors. Too hot or too cold temps can mean certain death for your crabs. Under the tank heaters and 15 watt reptile heat lamps make ideal heating sources for your enclosure. Hermit crabs are big time climbers. So consider accessorizing their cage with entertaining items like sanitized shells, fake plants and vines, ceramic pots, branches, driftwood, etc. Extra shells should be placed in the habitat for the hermit crab to change into something different as they grow. At least three shells per crab is recommended. The shells should be slightly larger or just as big as the one they now occupy. And please don't forget placing water bowls (so they can submerge) somewhere in their area, preferably on a decline so they feel they're near the shoreline. Small sponges can be placed in the water bowls to prevent accidental drowning. One bowl should contain freshwater (spring or de-chlorinated water) and the other saltwater (a mixture of spring or de-chlorinated and Aquarium Salt - not table salt!). Spot cleaning the aquarium is important for the health of your hermit crabs. The substrate should be cleaned often to remove waste and dirt. When water or food becomes filmy, dispose it and wash the dishes. It's best to change the substrate monthly or if a lot of bugs (like flies and gnats) invade the enclosure. Then wash the enclosure with vinegar and water and boil the toys and even the empty shells (and I said, the empty shells!). Finally, your crabs must be monitored at all times. If crabs begin to stress or are overheated, the loss of legs and claws are not uncommon. Maintaining the crabitat insures you'll have happy, healthy hermit crabs for years to come. For further information you can contact: The Hermit Crab Association.